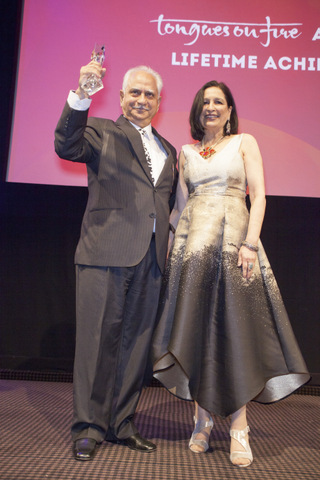 ONE OF THE great figures of Indian cinema, Ramesh Sippy, has lost none of his enthusiasm and zeal for his art. The director who made ‘Sholay’ spoke to www.asianculturevulture.com before his Closing Gala appearance at the UK Asian Film Festival and the curtain coming down on 11-day festival in London on Sunday (April 7) at the British Academy of Film and Television Arts (Bafta) in Piccadilly. 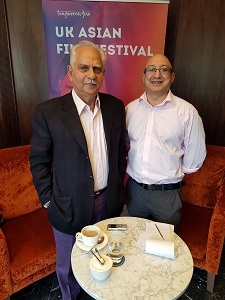 Sippy, in west London, on Friday (April 5) told acv: “There is one last frontier, I’ve started my academy (Ramesh Sippy Academy of Cinema and Entertainment/RSACE), it’s my way of giving back to the industry, and I really want to do something for web. “This is a new genre and it has a worldwide audience,” Sippy continued. In India, the term ‘webseries’ refers to streaming platforms and films being available online – Netflix and Amazon Prime are at the forefront of this and an industry is being forged in India, around developing content for them. Sippy’s ‘Sholay’ played in some Indian cinemas for years after its release and was adjudged one of the Films of the Millennium in a BBC survey. He reiterated the idea in conversation with the BBC Asian Network’s Haroon Rashid in his Closing Gala talk on Sunday (April 7). His wife, a well-known actor in her own right, confirmed this when she joined her husband and Rashid on stage. She said she was looking after business matters, while her husband could focus on the creative process. Sippy told acv he is working on a script, but clearly wants to do something that will connect to new generation and is keen to seek out an international audience too. He told acv that not many Millennials recognised ‘Sholay’. During the conversation with Rashid, he considered the idea of ‘Sholay’ overshadowing some of his other work – ‘Andaz’ (1971), ‘Seeta Aur Geeta’ (1972) and ‘Shakti’ (1982), all did well and feature some of the best-known names of Indian cinema at the time. In our interview, he also repeated the same word, ‘overshadowing’ – and while there is some acceptance of it being the case, he isn’t embarrassed about the idea of being solely associated with ‘Sholay’. There was no certainty at the time that ‘Sholay’ would be the huge success it became. “Some people said it could not be a big hit – because there is no mother figure, (as in ‘Mother India’ (1957, and an iconic film) but if I had worried about that, I wouldn’t have made ‘Sholay’,” said Sippy to acv. There was also, at the time, much criticism of him casting Bachcan in one of the two leading roles. Many credit Bachchan’s role in ‘Sholay’ as a defining one and a part that allowed ‘The Big B’, as he is known today, to turn the corner and became the superstar of that age. Today, no one would dispute his legendary status. Rashid humorously asked if Sippy had cast Bachchan simply because his previous films had been flops. The director said “yes” in a funny come back, but it was clear Sippy had given the decision some reflection, at the time. “He wasn’t supposed to be part of it, people kept putting me off him (Bachchan),” revealed Sippy to acv. “Many suggested Shatrughan Sinha (who has been much in the news lately as the politician and Indian MP has switched allegiances from the ruling BJP to the Congress Party as India elects a new Government over the next month), he was the up and coming actor at the time, and he had struck out in a big way. “But I already had enough stars in the film (Dharmendra, Hema Malini, Sanjeev Kumar) and Jaya Bhaduri (to become Bachchan’s wife). “I’d seen a couple of his films and he was recommended by the writers, they had worked with him on ‘Zanjeer’ (1973) that was one of his most successful films (then) and I had also seen ‘Anand’ (1971) and ‘Bombay to Goa’ (1972). They were two varying roles. “He had a serious role in ‘Anand’, alongside Rajesh Khanna (one of the biggest stars of the day) and he took much of the credit, but Bachchan was very much noticed. People had spotted him,” Sippy shared with acv. Bachan and wife Juneja talked about their TV series, ‘Buniyaad’. Juneja was an actor who played a leading role and the two married later. Essentially a Partition drama, many say it was another seminal work that lives long in the memory. Rashid asked whether the fact Sippy was born in pre-Partition Karachi (now in Pakistan) had anything to do with his decision to make ‘Buniyaad’. Sippy tentatively said, “yes” and went onto say he couldn’t help but show the trauma and distress, even though many had never talked about it. He said festivals had a role in highlighting films you might otherwise miss. “Once films (at festivals) like this come into the limelight and they can do even bigger work,” he declared. Earlier, the audience heard from Radhika Apte, who is a rising star in India and came out of the independent film circuit there (as opposed to Bollywood which is dominated by big Indian production houses). She had left her native Pune to go to London first to study contemporary dance. On a trip here, she had been transfixed by a friend who danced in a club. “I just had to do it,” said Apte, who had trained in Kathak previously. On her return to India, she moved to Mumbai and tried to break into the film industry and initially focused on theatre. A native Marathi speaker, she said she learnt that English wasn’t super important, especially after she arrived in London. Rashid called her the unofficial poster girl for Netflix in India – three series currently feature Apte prominently: ‘Sacred Games’, ‘Lust Stories’ and ‘Ghoul’. Apte revealed there was no real plan and continues to do work that fires her but conceded she does some roles that go against her principles. “I believe you can get something back,” she said. It is a strategy, she intimated – the more work and opportunities that come your way, the more you can affect change. 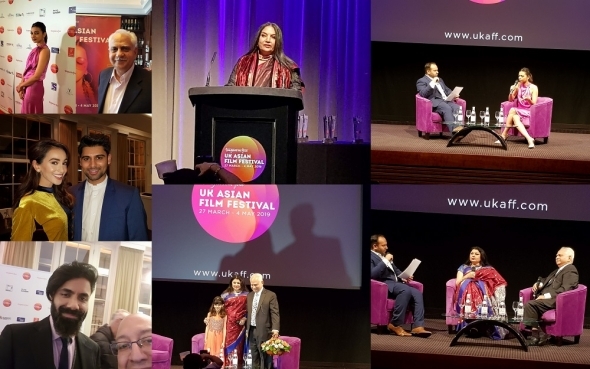 In her keynote address, Shabana Azmi saluted the fact that 34 women directors had presented their work at UKAFF. “That’s really quite a record”, she pronounced. She praised the role festivals had in raising issues of Diversity and telling Asian stories. “I hope you will encourage more people to come and watch these films, as supporters and I hope you will recognise how important it is to celebrate festivals of this kind and help them grow, ” she said. Dr Pushpinder Chowdhry MBE, founder and director said there would be more of a round-the-year-programme to bolster the festival itself. 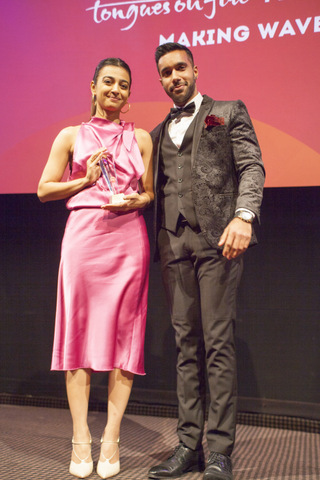 “Our vision is to change societal taboos through conversation prompted by cinema and make independent South Asian films and talent accessible to all UK wide audiences. 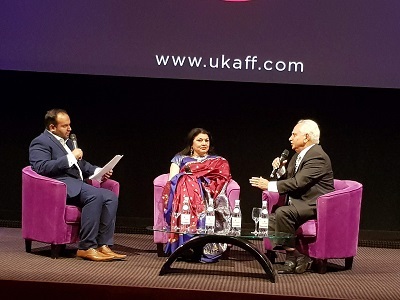 Earlier in the evening, Samir Bhamra, creative director of UKAFF and Minu Bakshi, chairperson UKAFF welcomed guests to the Closing Gala. Bakshi, a respected singer and poet, read Urdu poems, also welcoming guests. Bhamra saluted the work of the Young Curators Lab and Young Critics Vote in this year’s fest – a group of young people have been trained to curate and contribute to critical appraisals this year. 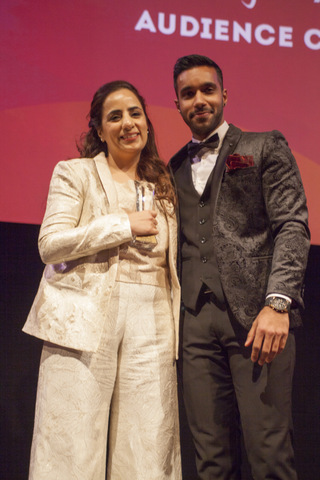 The awards were introduced by actors Rishi Nair and Nisha Aaliya and Suzi Mann, broadcaster, helped to get the awards section of the evening under way. The festival originally began as Tongues on Fire and was more recently called the London Asian Film Festival. See Gallery from Closing, festival pictures (March 27-April 7) through our forthcoming newsletter and story on Southall Black Sisters, Dissent & Subversion soon. Thanks to all at UKAFF, including all volunteers and everyone who made our Ek Aasha reception a great success.